Non-involute gears have reduced specific sliding. Reduced gear sliding has an affect on low speed meshes, where sliding losses predominate. 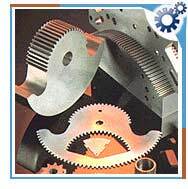 The efficiency of these gears is also increased by the use of less viscous oil. The tooth profile geometry is uniquely defined by the arc shaped path of contact. The gears manufactured by the same rack cutter have the concave convex mesh. The result of enlarged reduced radius of curvature has as a consequence reduced pressure and better lubrication conditions. The geometry of non-involute gear tooth provides substantially higher capacity than any other gearing. The disadvantages of the non-involute gearing are lower transverse contact ratio and great sensitivity to the center distance accuracy.